These principles stood in stark contrast to the dominant “producibility guidelines” of the time. Producibility guidelines directed designers to focus on simplifying individual parts so they were easier to manufacture and cost less. Dr. Boothroyd’s ground-breaking research exposed the fact that this practice actually led to substantially higher product costs relative to the use of fewer, multi-functional parts. Upon publication of this research, commercial implementation became a topic of great interest. In 1980, Dr. Peter Dewhurst joined Dr. Boothroyd to create the software package “Design for Automatic and Manual Assembly” (DFA) for the Apple II Plus. Subsequent interest from IBM and Digital Equipment led to the funding of a PC version, as well as the incorporation of Boothroyd Dewhurst Inc. in 1983. Major companies such as Ford and General Motors estimated that they were saving billions of dollars through DFA. As interest in DFA software expanded, so did interest in achieving precise knowledge of the cost savings associated with it. In 1985, Drs. Boothroyd and Dewhurst conducted further research that allowed for a “Design for Manufacture” (DFM) module to be added. DFM allowed early and accurate should-cost estimates to be made of various design proposals. Together, the two modules combined to form what is now known as DFMA®. The enormous benefits that DFMA® provided to leading manufacturers led President George H. W. Bush to award the founders of BDI the National Medal of Technology in 1991. 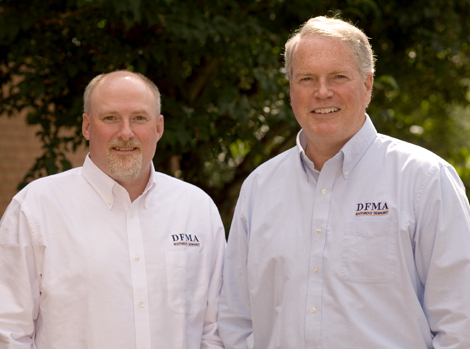 Boothroyd Dewhurst Inc. has continued to develop the DFMA® software tool for the past 30 years. In that time, DFMA® has helped hundreds of companies manufacture products at lower cost and with higher quality than was previously possible. The legacy of BDI continues today through President John Gilligan and Executive Vice President Nick Dewhurst. President George Bush awards the founders of Boothroyd Dewhurst, Inc., the National Medal of Technology "for their concept, development and commercialization of Design for Manufacture and Assembly (DFMA), which has dramatically reduced costs, improved product quality, and enhanced the competitiveness of major U.S. manufacturers." For more information about the Medal of Technology, please click here.